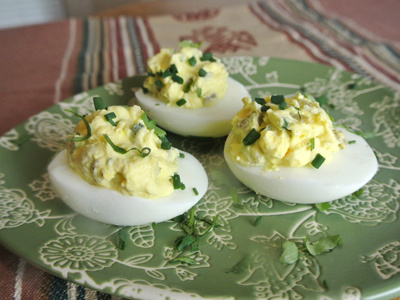 One thing my family always asks for is deviled eggs for Easter. It’s like a guilty pleasure that we indulge in every year and just wouldn’t be the same without a platter filled with them. 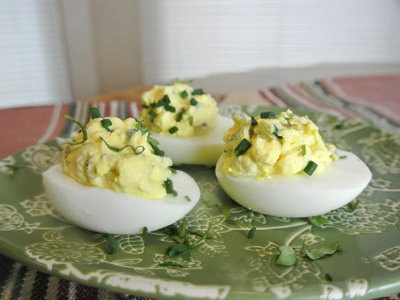 I always make my “Classic Deviled Eggs” and I will again this year but the cook in me wants to try new things. I’ve always wanted to try this recipe that I’ve had tucked away for many years from Chile Pepper Magazine. It has all the ingredients a New Mexican would love with a little bit of green chile, chives, cilantro and lime juice. Combined with the cooked egg yolk a mixture of mayo and sour cream will make a savory filling which will be a perfect compliment to a sweet slice of honey ham. I’m only making 6 eggs but you can easily double the recipe. 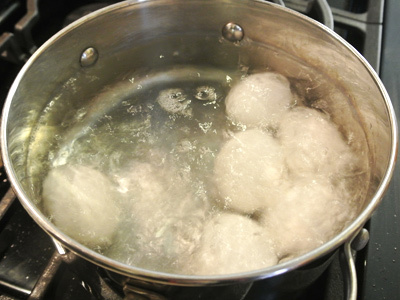 Start by placing the eggs in a heavy bottomed pot and fill with enough water to cover the eggs. Heat until boiling. Once they are boiling, turn down the heat or turn it off altogether and cover with a lid for 10 – 12 minutes. Run the eggs under cold water and peel. 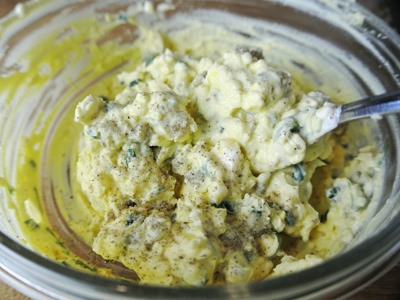 You’ll need some mayo, sour cream, green chile, chives, cilantro and a wedge of lime to add to the egg yolks to make the egg filler. Slice the peeled eggs in two and scoop out the egg yolks. 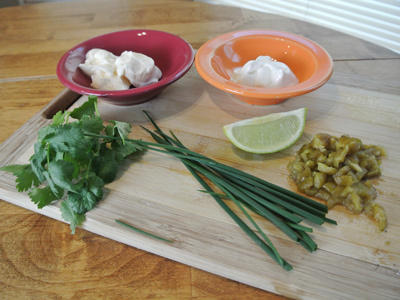 Place them in a bowl with the measured sour cream, mayo, chives, green chile, cilantro and lime juice. Use a fork to mash the egg yolks and combine with the filler ingredients. Sprinkle salt and pepper to taste. 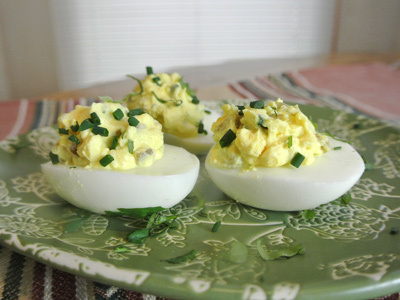 Fill the eggs with the egg yolk mixture and sprinkle with chives and cilantro. 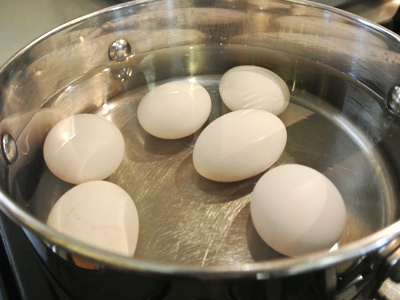 Hard boil the eggs by placing the eggs in a heavy bottomed pot and cover with cold water. Bring to a boil then turn down the heat to low or turn the heat off altogether and cover the pot with a lid for 10 – 12 minutes. When the eggs are ready, run under cold water and peel. Slice the eggs in half and scoop out the hard egg yolks. 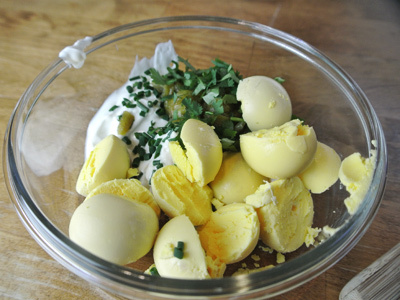 Place the yolks in a medium bowl along with the mayo, sour cream, green chiles, 1 tablespoon chives, 1 tablespoon cilantro and spritz of lime juice. Use a fork to mash the mixture together. Salt and pepper to taste. Divide the filling and spoon into the egg white halves. Sprinkle with chives and cilantro.